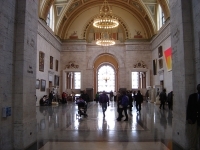 One of America's largest fine arts museums, the Detroit Institute of Art boasts more than 100 galleries, displaying a collection of about 65,000 works, ranging from mummies to Matisse, and Asian antiquities to American Impressionists. The Institute of Arts is conveniently situated in downtown Detroit, along with many of the city's top attractions. The highlights of the permanent exhibition include masterpieces by Rembrandt, Rubens, Bureghel the Elder, Botticelli, Van Gogh, Cézanne, Picasso and Caravaggio. From January till May the Film Theatre screens an impressive selection of international films and shorts, and the museum hosts regular temporary exhibitions and special events.